Everyone at RBB feels a responsibility for keeping our facility and everything (and everyone!) in it in good working order. We look for every possible way to ensure that the custom electronic boards that leave our facility are pristine, and have been built efficiently and exactly to our customer’s specifications. To do that, we need clean areas so we can focus on the job at hand. We need a well-maintained facility and a dedication to keeping personal spaces as neat as possible. RBB is split into 18 areas that encompass the entire building. Each area has a 6S Champion. That person is responsible for making sure their area meets 6S standards and that all action items coming from the audits are complete. Audits are conducted monthly in every area by 6S auditors. Auditors are chosen from all walks of RBB life and rotate through the audit schedule providing each area with a fresh set of eyes each month. 6S stands for: Sort, Sweep, Straighten, Schedule, Sustain and Safety. Here’s how RBB defines it. Decide what you really need to do your job and get rid of everything else. Not sure about something? Make a spot – somewhere that won’t interfere with performing your job – and set it there. If you haven’t touched it in a week, get rid of it or consider storing it where it’s out of your work area. Neatness and efficiency go hand-in-hand. “Sweep” is a broad term for keeping everything clean. Floors are swept. Shelves are dusted. Waste baskets are emptied. It’s simple: a place for everything and everything in its place. Label bins. Outline tools on a pegboard and put them back in the same spot every time. Tape off areas on the floor for rolling carts. Be creative. 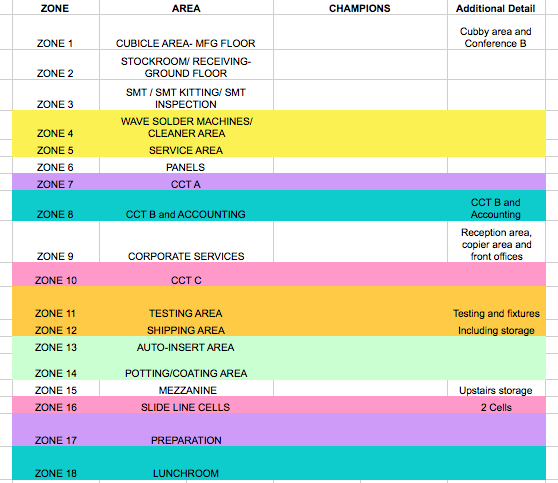 This means that the 6S schedule and checklist is posted where everyone can see. It means all PM’s have been performed and logged and the metrics and charts are current. Simply, everyone in the area is dedicated to sustaining 6S standards as evidenced by maintaining superior audit scores. We make sure all areas are free of any safety hazards. This includes making sure machines work properly and tools are in tip-top shape. And there you have it - RBB’s 6S program in a nutshell. The program as a whole means we serve our custom electronics customers better. In the end, this is what really matters and what drives our processes and improvements. If you would like to learn more about RBB’s program and how it’s managed, please feel free to give us a call. We'd love to hear your ideas as well. What are some ways your manufacturing company keeps its facilities clean?